Suffolk Naturalist: April fools day! Well the weather was looking good again even so a stroll over Purdis Heath was on the cards, but not before a spot of gardening and finding pollinator from my local garden centre wasn't easy. It seems like B&Q are more about the 'Cha ching, cha ching' rather than the 'Buzz, buzz'. However, we found a couple of little plants for our newly built flower bed in the garden and I set to work. I had just dug a little hole to drop a plant into and was about to fill it up with water when I spotted this little fella in the bottom of the hole. A bee with a very hairy nose! It turns out, it was a male Tawny Mining Bee Andrena fulva. How do I know it was a male? My research told me that the males have this typically hairy face and the species gets its name from the female which is almost orange/red in colour (I know, not tawny, but don't ask me why). 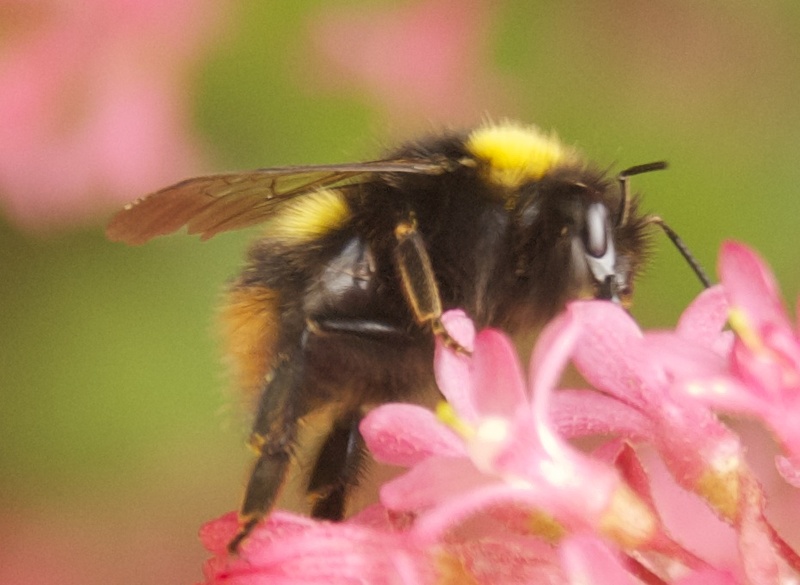 But hey, it's another species to the list and as there are approximately 250 species of bee in the UK, I can still add a lot more. 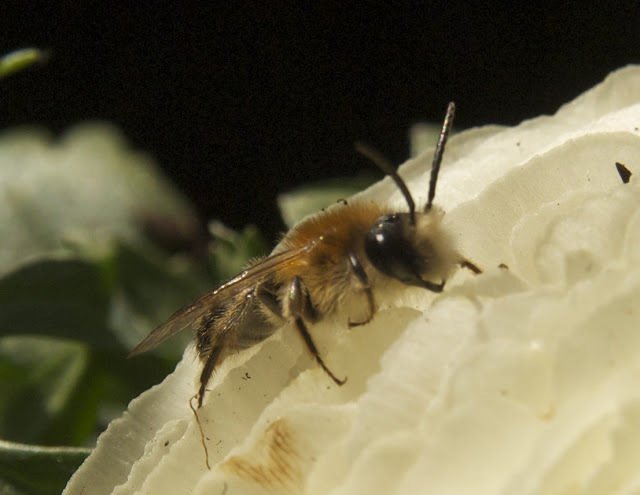 Interesting fact here is that the Honeybee Apis mellifera is the only bee that produces honey! So, with another species under my belt, off I went to wander round my local nature area, Purdis Heath. Although the sun was shining and it was warm in the sun, there was a chill in the air and I was hoping to see some butterflies, but at the same time, thought it would be unlikely. I done my usual wandering off the beaten track deep into the dead bracken scanning ahead with my bins in the hope of spotting an Adder Vipera berus, which haven't been recorded here before, but it is likely habitat for them. 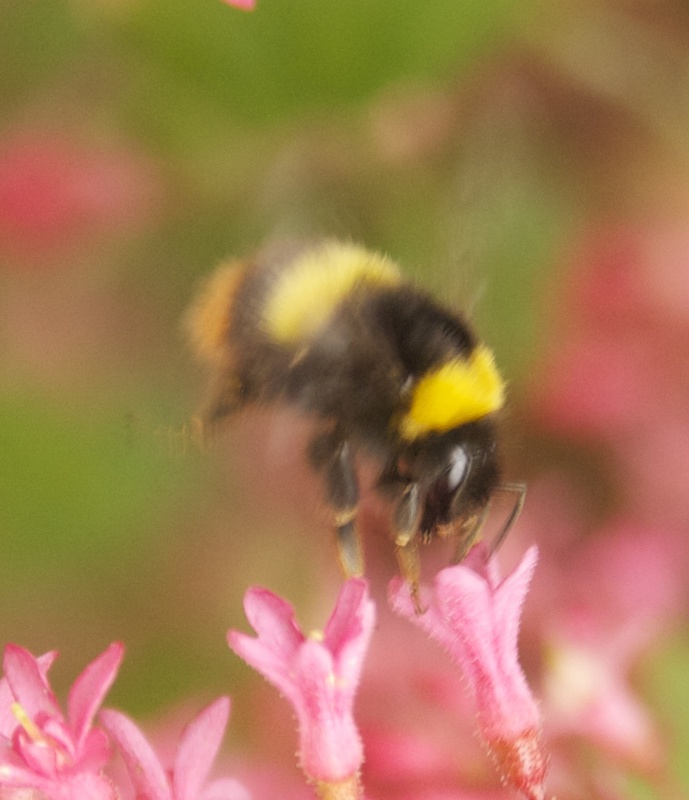 Then, whilst scanning, I spotted a small, what at first I thought was a bee. 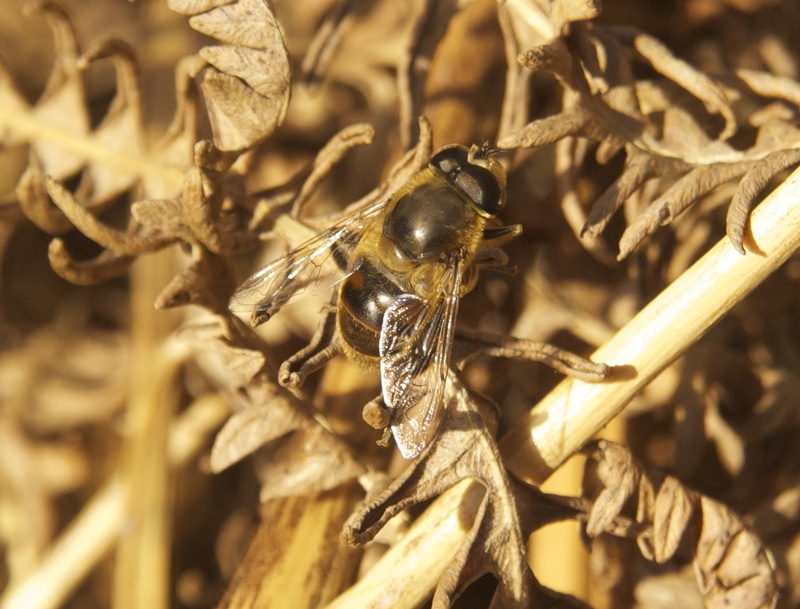 As I moved in I kept snapping away until I could get pretty close in to snap my first ever Drone Fly Eristalis tenax. E tenax looking very much like a bee. These are so called because of their resemblance to the drone worker bees of the Honeybee A mellifera. A very good reason for this would be defence, frogs, toads and other fly eating predators are not so keen on eating something that stings. The yellow flowers of the surrounding gorse bushes were quite brilliant, yet a butterfly could not be seen. However, I could see glimmering in the sunshine the fine silky threads of spider silk. This silk is known also as gossamer and is not only used for catching their prey. It is also used for something called ballooning and the next time you find a little money spider on you, and you are outdoors and it's a bit windy, you might see this ballooning in action. Let the little spider climb up your skyward pointing finger and if the conditions are right the little fellow will reach the top, do a little circle to make sure he's at the top then he will face into the wind, point his tail in the air and release a long line of gossamer. As soon as enough has been released the spider will let go and be carried off by the wind. beats walking even when you do have eight legs. Little money spiders have been found floating at around 10,000ft above sea level, so it's an efficient way of getting around by any standards. Another fact is that spider silk is also comparable in strength to high grade alloy steel! So, with all this gossamer floating around it wasn't long before I found my first spider of the day (don't worry, photos later as per usual). It was an unusual spider called a Crab Spider Misumena vatea. 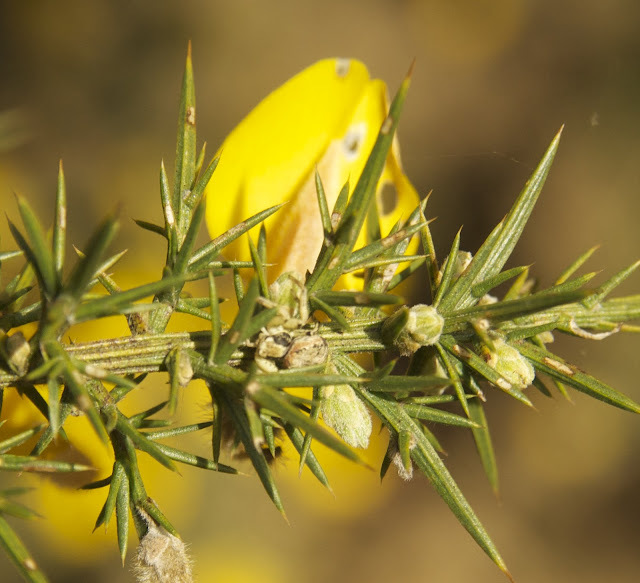 This spider is about the size of a 5p piece and is usually found on white or yellow flowered plants like gorse. It waits just under the flower head and when an insect such as a butterfly lands on the flower to nectar, the spider pounces and dinner is captured. The spider is also able to change its colour over a few days, but only to different shades of light green to white to help them camouflage themselves. When you see the picture at the bottom of this blog (after the list), you will see just how good the camouflage is. 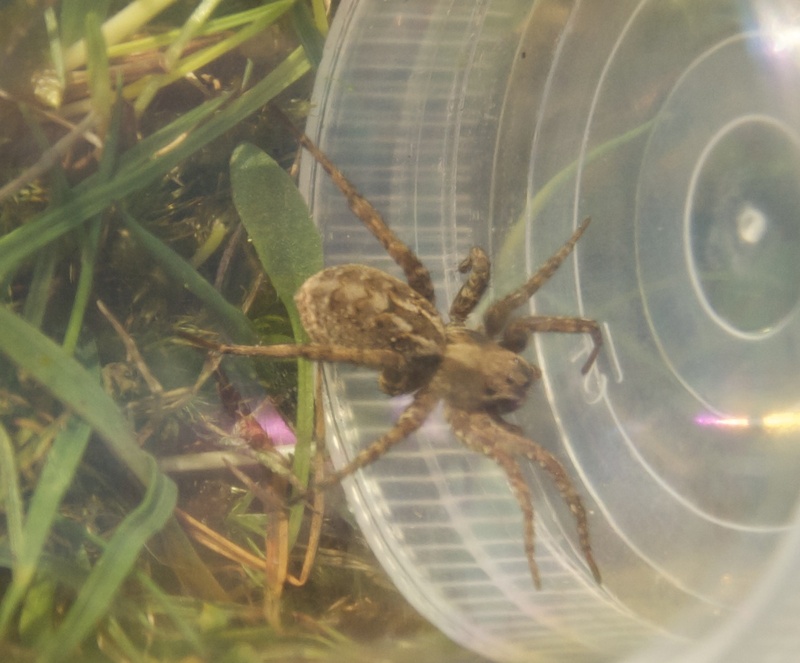 On the subject of spiders, a little later, amongst the spongy dry moss near the heather I came across my first wolf spider! 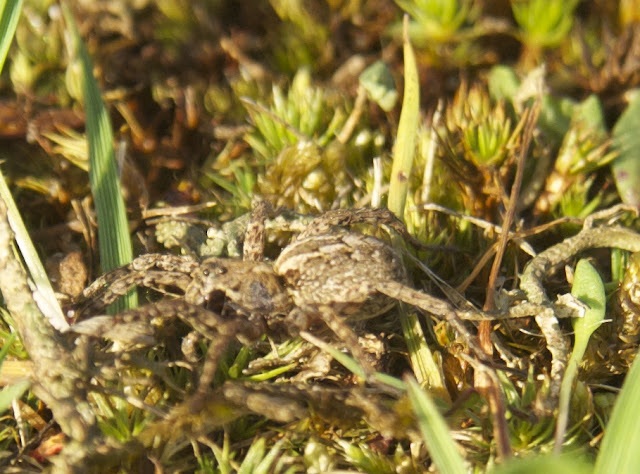 A Common Fox-spider, I know, I called it a wolf spider and that's exactly what it is. No, not a spider that hunts wolves or howls at the moon, they were called wolf spiders because it was believed that they hunted in packs. They do not, but wouldn't it be cool if they did, but they don't. Anyhoo, it was still a wonderful looking spider which you will see at the end. Whilst I was examining this spider I had one of those moments where you wish that your eyes were video cameras. I caught in the corner of my eye a Crab Spider M vatea crawl out of the undergrowth sideways like a crab emerging from a hole on the beach. Absolutely amazing and the reason why they're called Crab Spiders. A few days later in the week saw me in the wilds of Northamptonshire next to an open field waiting to be unloaded. During this time I got another first for me, a Corn Bunting Emberiza calandra. Not long after this I saw another bird of the same family E citrinella, the Yellowhammer, a bird whose song goes 'a little bread and butter no cheeeeeeeese'. Unfortunately, I wasn't able to get close enough to get any pictures of the birdies, sorry. Good Friday found me visiting friends and family but not before a visit to the Ipswich Museum, which has been on the cards for a good few years now. It was my first visit to this place and Wow! What a place. You might not believe me when I say this, but wifey agreed too, it's even better than the Natural History Museum in London. Yes, it's true I tell you. Me and wifey went there a couple of years ago, my first time since my childhood. I remember from my school visit many moons ago of loads of display cabinets full of different specimens. Rows upon rows of cabinets with insects of all shapes and sizes were displayed. I was just too young to take it all in at the time, so when I visted the NHM, I was quite excited to get a proper look at all the cabinets again. What a let down! Gone were the cabinets, replaced with vast open spaces and electronic dumbed down story boards. Such a shame. However, walking into the Ipswich Museum to be greeted by a full size replica Wooly Mammoth, surrounded by, you guessed it, cabinets full of specimens caught and stuffed a long time ago (Victorian in fact), filled me with that school boy wonderment again. Such a wonderful place that is so much smaller than NHM, yet sooooooooooooooooooooo much better. Alas, their insect collection wasn't on display, but I was informed that they still have it in storage, so there is hope that one day they will get it out again for people like me to browse and drool over it. Unfortunately, due to a dodgy car parking ticket machine that tried to nick our money, we was only able to get a hours car parking. But fear not, I will be back Ipswich Museum, I will be back. 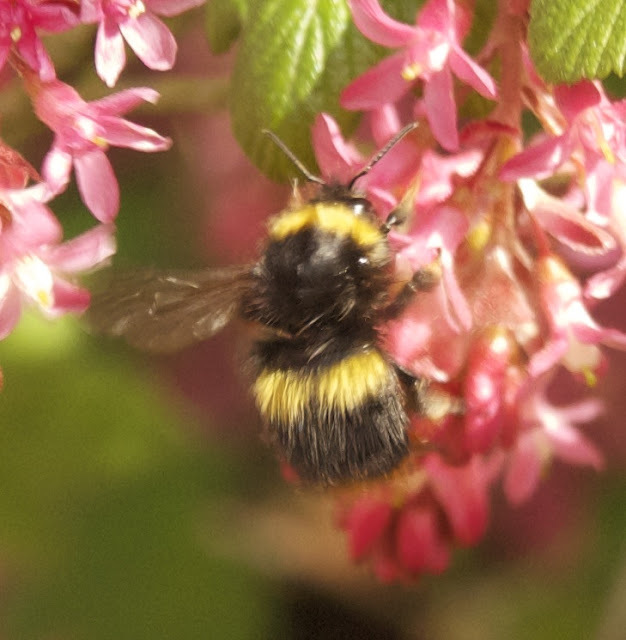 On to visiting relatives and this particular relative had the same ornamental raspberry bush in their garden that I have in mine and like mine it was always busy with visiting bumblers and like I promised you last week, I have the photo of the Red-tailed Bumblebee B lapidarius. B lapidarius feeding on an ornamental raspberry bush. 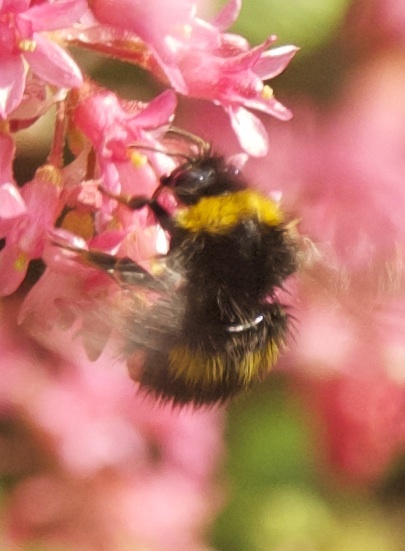 There was also another visitor to this bush that I hadn't got before and it was the Early Bumblebee B pratorum. I'm sure if I had stayed a little longer I would've recorded many more bees as this was quite a busy bush that was twice the size of my one at home. At one point there were 3 Red-tailed Bumblers B lapidarius. As you may have noticed, there are no moths here today and that's because it was raining last night, which isn't good for moths. But have no fear as the moth trap will be getting an airing tonight, so watch this space. Whilst the moths will be flocking to my back garden, I will be out having a little wander with the bat detector looking for, guess what, bats! I hope to record the sounds for inclusion to my next blog post, that's the plan. With bees out and about doing their thang and last weeks news report on how pesticides are causing the decline of our beloved bumblers, this blog from Bee Strawbridge is worth looking at. 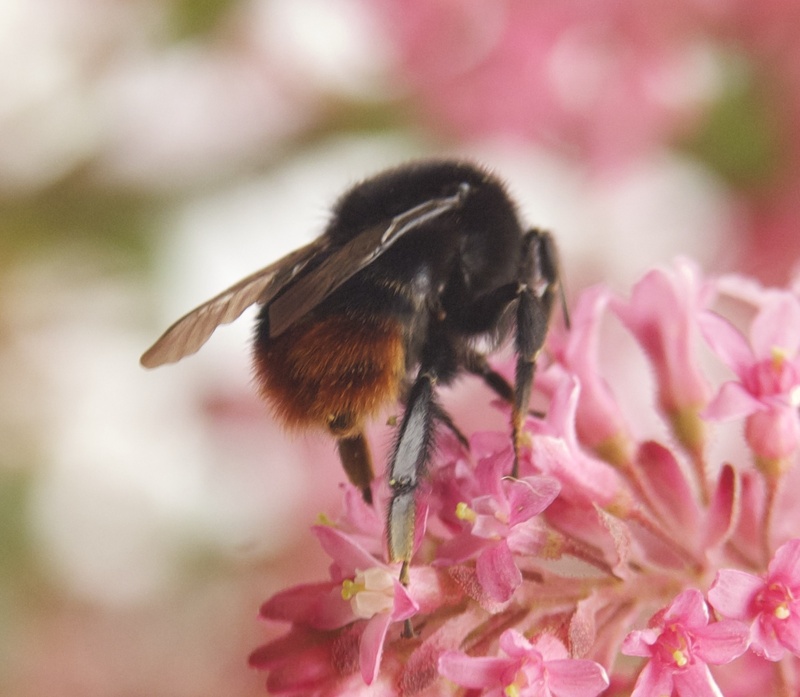 Still on bees, the other site is from the Bumblebee Conservation Trust and is really good in helping to id those bumblers around your bush! SPIDER ALERT!!! LOOK AWAY NOW ARACHNOPHOBES!!!! 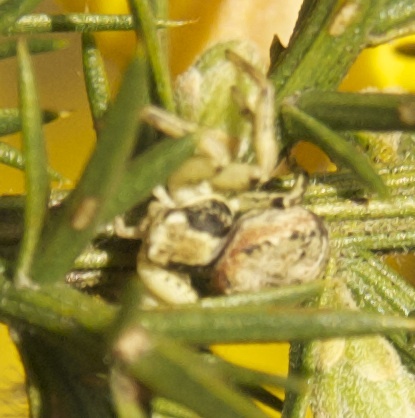 M vatia hiding near flower on gorse. Can you spot it? A pulverulenta the Common Fox-spider that's a wolf spider. Notice the eyes on top of the head. A pulverulenta captured for a better picture to show its beautiful patterning. For those still with us, Happy Easter!